This month at Linger we will be bring you ‘double bow’ tunes courtesy of our cellist, Loren Dempster, a new Arabic arrangement and some exotic selections as well from our violist, Leanne Darling, and we’ll sprinkle in some sprightly Celtic tunes. Also, we’ll be plugging and getting ‘loopy’ to preview selections from our upcoming Roulette show on April 22. We hope you’ll come on out to enjoy brunch with us! 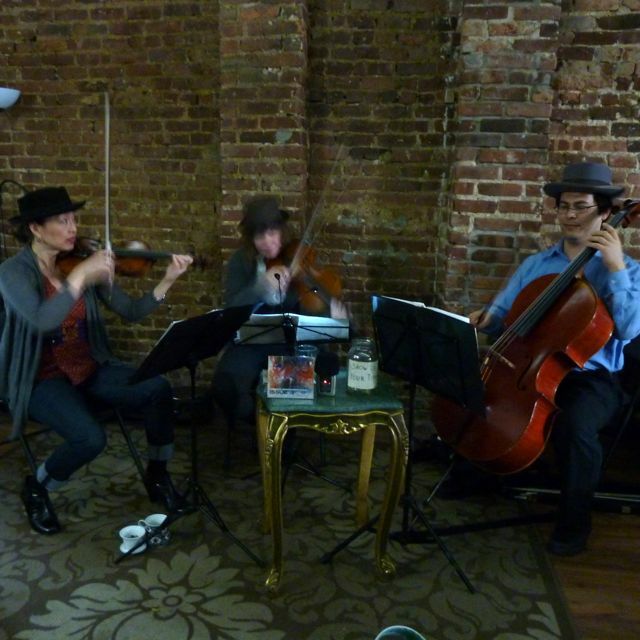 Here a snap of us in our porkpie hats doing our November homage to ska, “A Message to You Rudy.” We continue our residency this month at Linger Cafe and Lounge, bringing back some old favorites, including the African-inspired Issue #2, swinging Bernie’s Tune, some Piazzolla with Libertango, and the Arabic pop favorite, Azizah. Come join us for brunch and more! 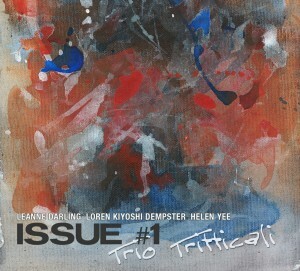 Lucid Culture reviewed Trio Tritticali’s debut album, and we’re honored to be named as one of the best albums of 2011. 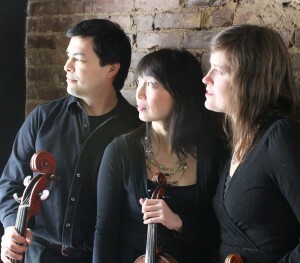 And yes, we’re playing Linger Cafe on Sunday, December 11 at 2pm. We just wanted to give you all a peek at the cover. Now we’re in the midst of the logistics and processing that accompanies selling these babies online, both physical CDs and digital audio. We’ll let you know when that’s ready, but we just couldn’t wait to show you what the CD looks like! 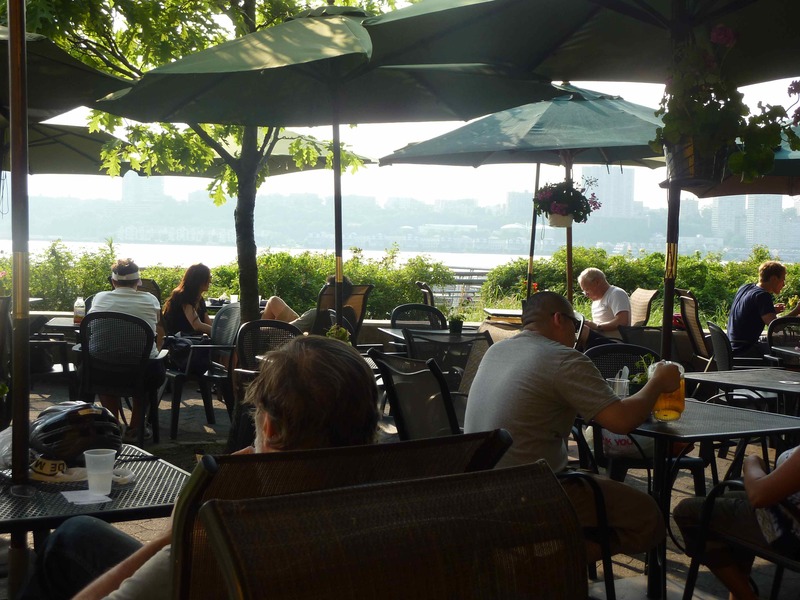 We’re performing two sets as part of the Amplified Sundays series, part of Summer on the Hudson 2011 at Riverside Park, Pier 1 at 70th Street and the Hudson River. Our brand new CD, “Issue #1” will be ready by then, so it is going to be an extra special day for us! Riverside Park, Hudson River and W 70th St. 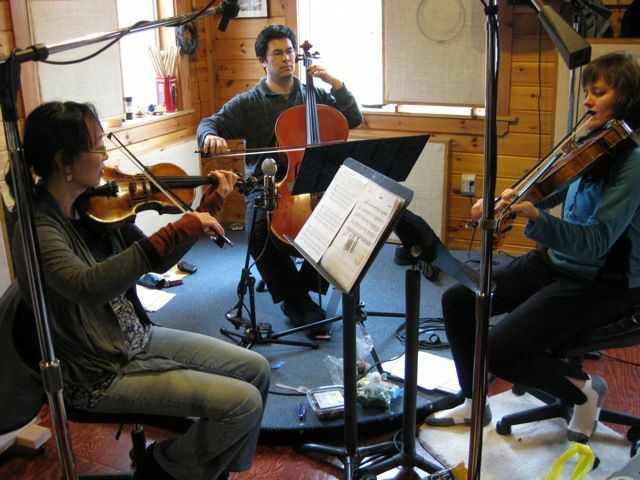 In late April, Trio Tritticali jumped into a car and drove to Trick Dog Recording, in scenic Glen Spey, New York to begin work on our new CD. Paul Mitchell, engineer extraordinaire, had recorded two of Invert’s releases as well as Leanne’s solo CD a few years ago, so we are sure we are in good hands. We’re now in the process of editing and mixing the CD with Paul, and we’re hoping to have a finished product sometime this summer. Stayed tuned! 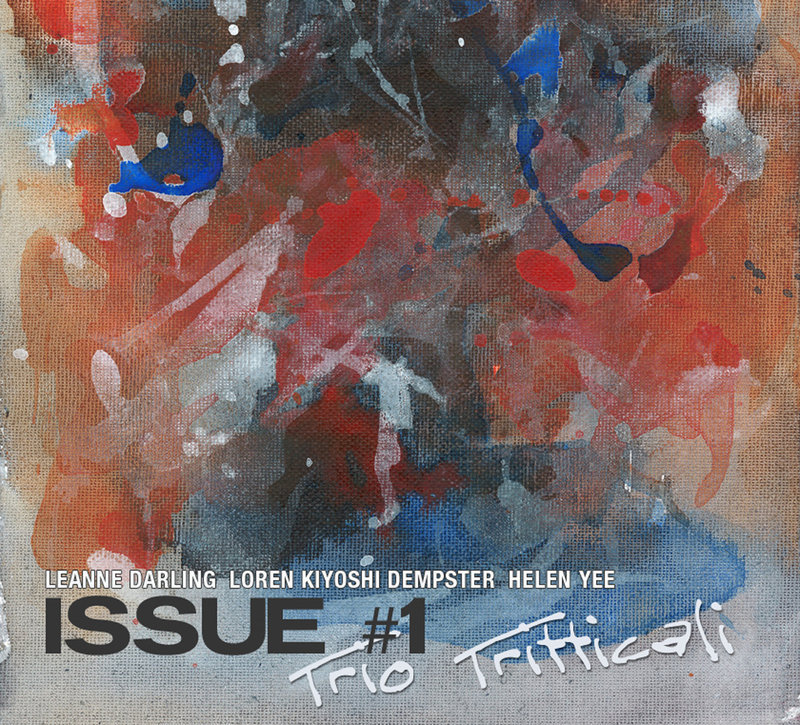 Excerpts from a Trio Tritticali performance December 2010, with Leanne Darling on viola, Helen Yee on violin, Loren Dempster on cello. 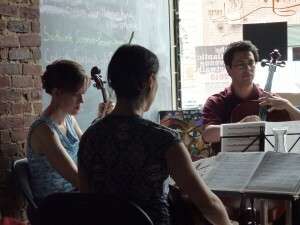 In this video we’re all decked out in formal, classical-like garb—not our usual attire at brunch! We hope you all can come to our next show at Linger Cafe and Lounge on February 27, but we probably won’t be disguised as a classical string trio. You can expect our eclectic mix of musical genres, accompanied by yummy brunch fare prepared by proprietress, Jessica Pichardo. 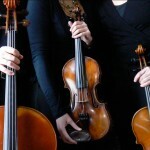 Trio Tritticali will be playing our last gig of the year, and we’d love to have a chance to see you all. Winter’s is truly making itself felt, but fortunately the warm ambience and soul-satisfying fare at Linger will keep Jack Frost from nipping at your nose. One set only. We hope to see you there! subway: 2,3,4,D,N,R,Q to Atlantic/Pacific, one block west. 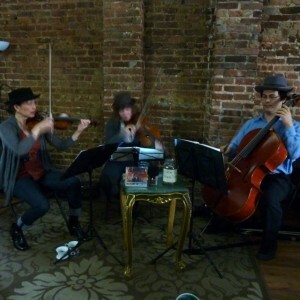 Come on out to hear us in our home away from home, Linger Cafe and Lounge. The superb Loren Dempster joins us on cello. 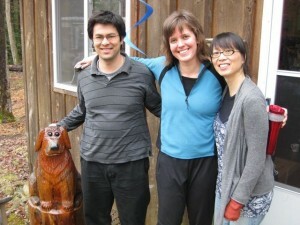 Enjoy the new fall menu of yummy tunes and delicious brunch fare, in Linger’s warm embrace. One set only, so don’t miss your chance to hear us before it starts to snow. Ha!